This post contains mild spoilers for the upcoming season of FXX's It's Always Sunny in Philadelphia. BEVERLY HILLS, Calif. — Nobody misses "Fat Mac" more than Philadelphia's Rob McElhenney. "I miss him every day," he told reporters Friday. The creator and costar of FXX's It's Always Sunny in Philadelphia once put on 50 pounds just to challenge the sitcom tradition that has characters becoming better looking over time. Now he's gone in the opposite direction, hitting the gym for six months and adhering to a diet to prepare, he said Friday, for what's essentially a 30-second joke in which his character, Mac, pulls off his shirt to show it off to the gang and is immediately told to put it back on. "He absolutely lives in the gym. Evenings, mornings, weekends, yeah," said Kaitlin Olson, who's both McElhenney's costar on Sunny and his wife of nearly 10 years, after an FXX session for the show. Mindy Kaling guest stars this season, brought in, McElhenney said, "because we wanted to do an episode where we were going to replace Dennis [Howerton], and we felt like she was a worthy adversary." Howerton, who's also starring in NBC's A.P. Bio, will be back, McElhenney confirmed, though he wasn't here Friday, possibly to keep the ruse going. "We're not really going out of our way to keep it a secret, but it just seems to be happening," McElhenney said. "We're just not posting pictures with him at all," Olson said. "I'll post a picture of Mindy and people will be upset," McElhenney said. "I feel so bad for her," Olson said. "But it's nothing to do with her, it's just, 'That's not Dennis!' No, it's Mindy Kaling. Be nice." This season, the show also will be delving deeper into Mac's sexuality, which finally was addressed openly midway through the 12th season, when the character came out as gay. This being Sunny, the development might not have ended up being much of one, but after positive response from LBGTQ viewers, it looks as if Mac will be continuing the coming-out process and exploring life as a gay man. According to FXX's official synopsis, we can also expect acknowledgment of Philadelphia's status as a Super Bowl champion, with an episode in which Danny DeVito's character, Frank, "goes to great lengths for the Gang to experience the greatest moment in Philadelphia sports history — an Eagles Super Bowl victory." 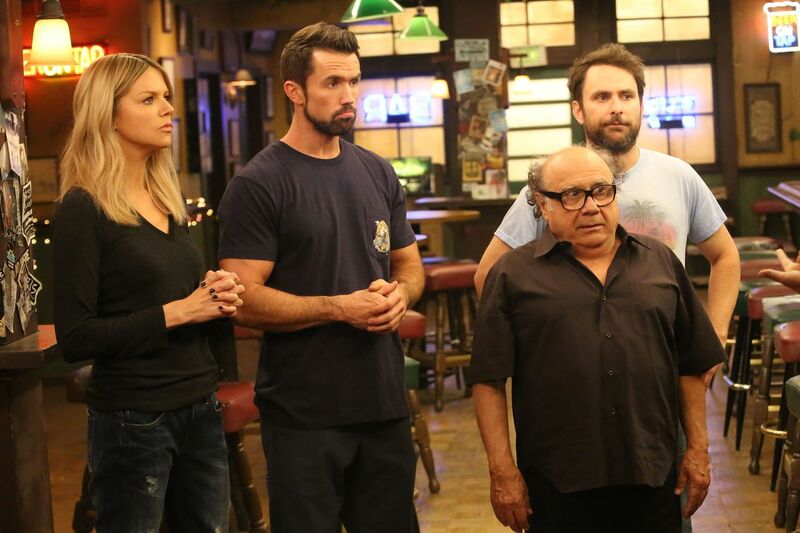 It's Always Sunny is already renewed for a 14th season, after which "we'll see," McElhenney said. "You keep watching it, and we'll keep making it." "Especially after taking a year off, I think we're all completely refreshed," Olson said. "It's a really fun season."